We used to live in Berkeley in a crooked little house built in 1890. It was built by an old sea captain after he left the helm and settled on land. It’s on the walking tour of historic Berkeley homes. I loved it, loved my west facing garden, the tree house for my sons that overlooked the street. Michael, my youngest, was born while we lived there. To mark the occasion of his birth, a friend gave me a bare root apricot tree. I planted it beside the long driveway leading to our carriage house in the back. Although the story is too long and sad to relate, we lost the house and wandered homeless for a number of years, me and my kids. During those uprooted days, I’d sometimes go by our old house. The new owners kept our lace curtains, painted the front door a charming orange, and the apricot tree thrived. It blossomed and thickened, just like Michael, who now has his own son. We hope this new child, this sapling, will also grow to splendor. But, we also know, sometimes parents aren’t so lucky and that’s why people plant Life Gardens—a living memorial garden for loved ones. For families who’ve suffered the devastating loss of a child or the senseless loss of a loved one, a life garden can create a tangible place to go to remember those we’ve tragically lost and find comfort in the growth. It can be a single plant or a fully designed sanctuary. It can be for a child or a parent, a spouse, a treasured friend, for innocents slaughtered while anticipating a moment’s pleasure. for victims of the movie theater shooting in Aurora Colorado July 25, 2012.
and several remain hospitalized in critical condition. 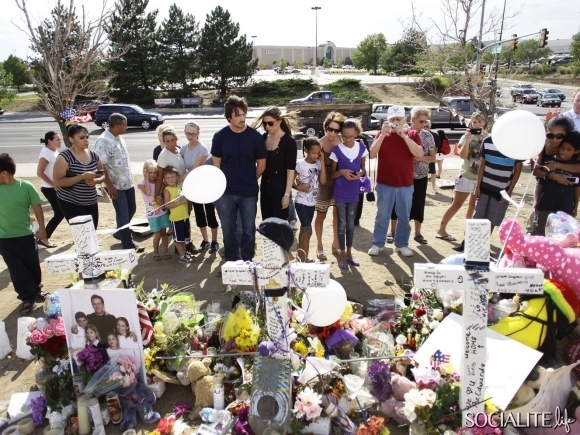 of the July 25, 2012 shooting at an Aurora Colorado movie theater. 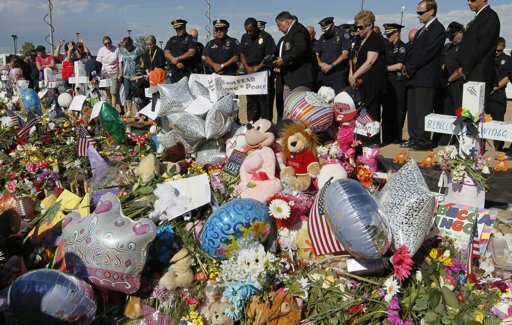 In Aurora Colorado where 12 innocent people- from a three-month-old baby to a 53 year-old man– the vacant lot where the makeshift memorial has been created would make a good place to establish a Life Garden. Couldn’t help but notice from the news photos that the vacant land is for sale. A life garden can be small or large, but the intention is to create a growing place for reflection and prayer, a place to sit and take in the colors, the fragrances, wildlife, and be soothed. Memory stones with meaningful inscriptions can be placed along a path to the planting. Well-tuned wind chimes or sculptures can add to the serenity. It can become a place where sadness is sorted and transformed, where healing takes place. 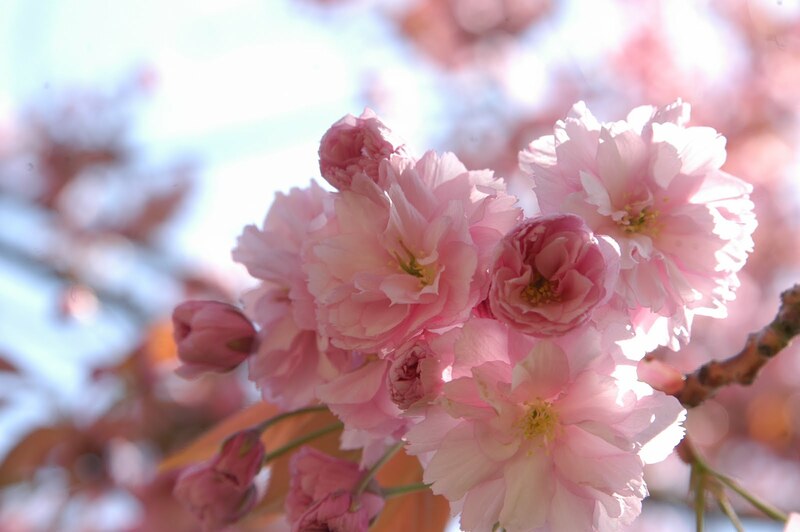 It also can be a touchstone, a reminder, as well as a blooming place of joy. We have a new house now, but I still drive by our old one in Berkeley whenever I can to look at the apricot tree, especially in spring when buds have formed and pink edges promise smiles through yet to emerge blossoms. I think about that tree and it eases the loss. I’d like to say the same when I think about that vacant lot in Aurora.